Use Case Estimation is a comprehensive project estimation tool that is used to calculate effort using Use Case and Actor elements. The complexity of the work environment is set using a series of weighted Technical and Environmental Complexity factors and Use Cases and Actors are given a rating that assigns their complexity as: Easy, Medium or Complex. The method is based on Karner's Use Case Points Method, and allows a metrics report containing the project estimation analysis to be produced and incorporated into project documentation. 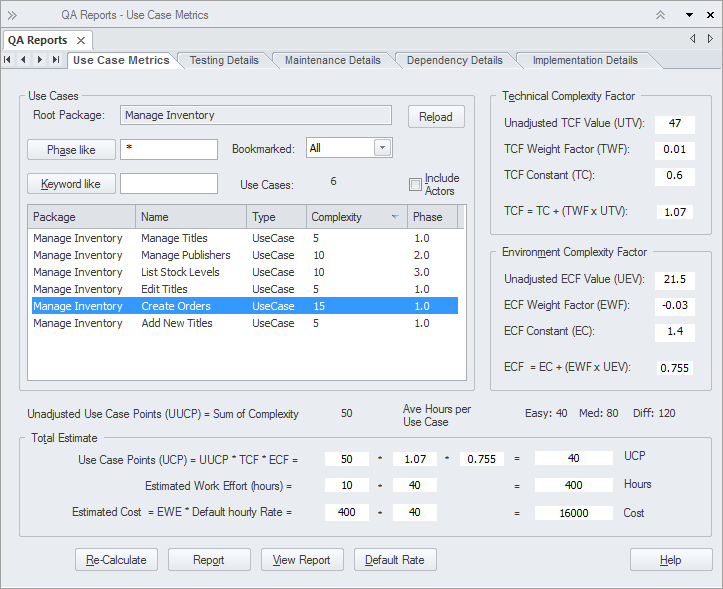 Use Case Estimation can be used to calculate the required effort to complete an initiative or part of an initiative. Environmental and Technical complexity factors can be defined and given weights and values that determine how they influence the effort that is calculated for an initiative. A value can be assigned to the phase property of one or more Use Cases; this value can be used subsequently as the criteria of a filter to restrict the estimates to just that phase. 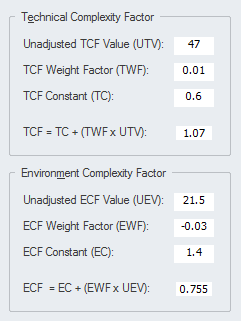 The estimate can also be filtered based on a Tagged Value set on the Use Cases such as Criticality.